Have Doyle and Graves proven that these are the same people? Re: Have Doyle and Graves proven that these are the same people? 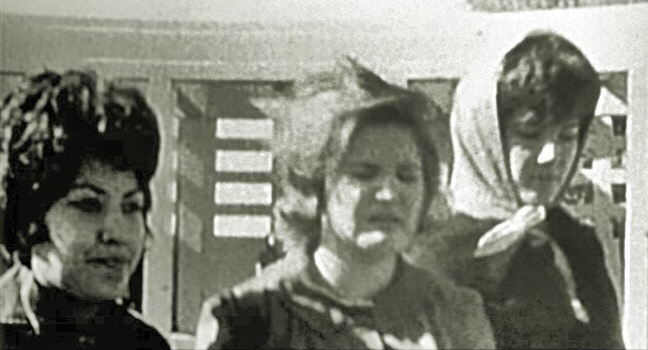 Why aren't you unequivocally stating that the big, tall, black-headscarf-wearing woman in Zapruder -- wearing the greenish skirt with the broad (but subtle), alternating, dark-colored and light-colored horizontal stripes -- can't POSSIBLY be big, tall, dark-red-haired Gloria Calvery, because because because, you know ... gasp ... Karen Westbrook DONE IDENTIFIED herself as the light-blue headscarf-wearing gal, and the average-sized, strawberry-blonde gal next to "her" as big, tall, dark-red-haired Gloria Calvery on the smilin' and noddin' Stephen Fagin show (albeit from behind and 54 years after-the-fact)? Because it's just a claim -- not proof. It's just more credible than your claim without proof at the moment, because she was there and you weren't. If you were to watch the 2-to-3 second clip which the black-and-white Darnell frame, above, came from, you'd realize that the gal wearing the headscarf (Sharron Simmons) and the crying gal (Gloria Holt) are still on the very edge of the grassy slope, and that all three of them have just come down from even higher up on the grass, as indicated by the Cabluck photo which shows two of them, -- the dark-complected gal on the left (Stella Mae Jacob) consoling the gal in the middle (Gloria Holt). It's at the end of this video. Note how headscarf-wearing Sharron Simmons eyes the ground and then kinda bounces down to the sidewalk at the very end. "Yes, I can see [an alternating-black-and-white-horizontal-stripes] pattern in the [greenish-colored] skirt of the [big, tall] woman in Zapruder who may or may not be Calvery. [In] Darnell, not so much." When you say, "Not so much" do you mean "just a little bit"? I think you're probably right about that. 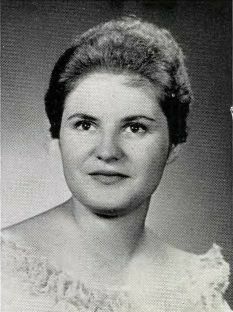 Do you have an actual known photo of Sharon Simmons? No, I mean not at all. Ok, I found her high school yearbook. 1962 Adamson High. To see the whereabouts of the three women when captured by Darnell please review the thread “Tina Tower film” by Robin Unger in this board about 14 threads below. Tina's film shows Jacob, Holt and Simmons walking eastward on the concrete terrace near or on the steps, not sidewalk, in front of the pergola. From stage left Jimmy Darnell races to the girls just before he captures the familiar black and white film of their approaching distraught faces. Just for FYI. At least I was apparently right about Simmons' (and Holt's, to a lesser extent) stepping down to a lower level at the very end of that short clip, at which point we can see that those three women really were about the same height!